One more thing which was not available for universal interfaces is the back button. You know that all Windows Phone devices have hardware or software back button. So, when you develop Windows Phone 8.x applications you need to handle that button but in case of Windows 8.x applications you need to create your own back button from scratch. Of course, Microsoft published design guide how to create and handle back button in Windows 8.x applications but the approach was very different compared to the Windows Phone. Starting with Windows 10 developers can use the same approach everywhere. Let’s see what happens in the desktop mode if you run code above. You can see that the back button is added to the application title and users can click it like the back button on phone devices. If you resize Setting window to the minimum size you can see that the back button is implemented there in the same way. 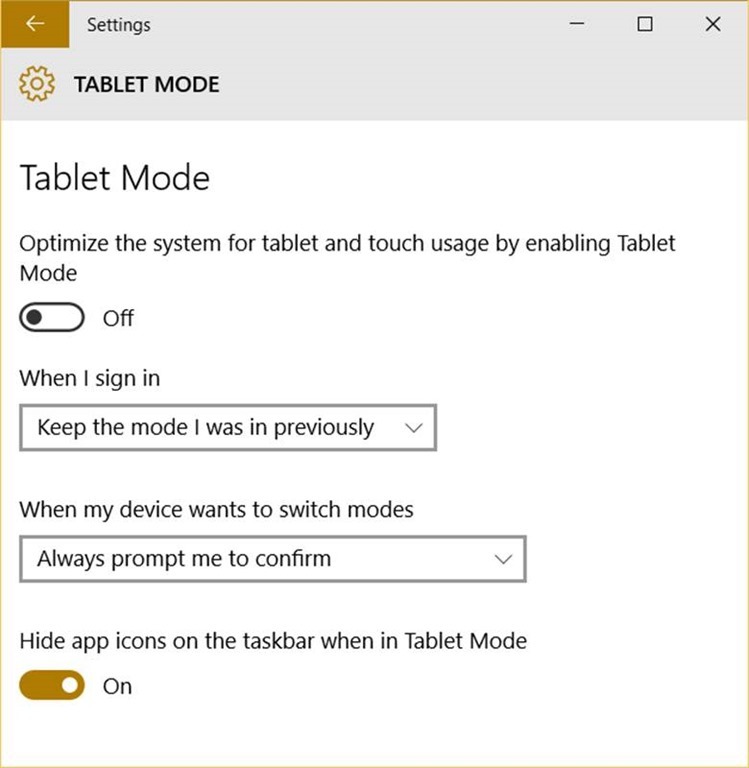 Once you switch Windows to the tablet mode you can see that the back button is displayed on the taskbar (outside your interface) but it still works fine. So, the back button is everywhere and with the help of the Universal Windows Platform developers can use the same approach to implement the back button user experience.